Salads are a favorite of mine any time of the year. I especially love coming up with salads that highlight seasonal ingredients. For example, fresh sweet corn and juicy, red tomatoes often turn up in my summer salad creations. Radishes, scallions and fresh-from-the-garden peas usually make appearances in salads that I enjoy throughout the spring. For this salad, I'm showcasing sweet potatoes - one of my favorite ingredients of all time. Roasting them enhances their flavor and brings out their natural sweetness. They really shine here and lend themselves well to my hearty, fall-inspired Roasted Sweet Potato Salad with Apple Cider Vinaigrette. I've taken just a handful of autumnal ingredients and turned them into a fresh, yet hearty salad that is great on its own or paired with pork chops for dinner. This salad, also, holds up well, so it's perfect to take along to work if there are any leftovers. 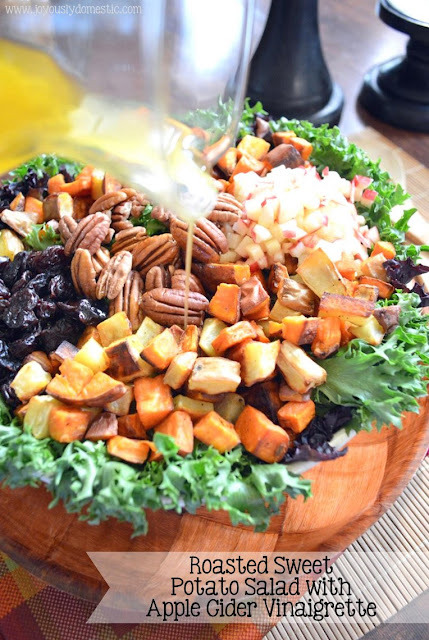 I've used both white and traditional sweet potatoes in this salad, but feel free to use whatever variety you can find or prefer. I like serving the roasted sweet potatoes and their accompanying ingredients atop a bed of arugula or other dark, leafy greens. But, you can totally omit the greens, if desired, and serve some cooked quinoa, wild rice or other grain as the base instead. Preheat oven to 400 degrees. Line a large baking sheet with foil or parchment paper. Spread sweet potatoes onto pan. Drizzle on olive oil, salt and pepper. Stir/toss to coat. Roast in oven for 40 - 50 minutes or until potatoes are lightly browned. Stir 1 - 2 times during roasting. Meanwhile, whisk together in a small bowl or shake in a lidded glass jar the vinaigrette ingredients. Set aside until ready to dress salad. To assemble salad, lay down greens in a large bowl or onto a large platter. Top with roasted potatoes, pecans, dried fruit(s) and chopped apple in preferred arranged order. Drizzle on vinaigrette (whisk/shake dressing again just prior to using). Toss salad and serve. Salad can be served room temperature or cold.